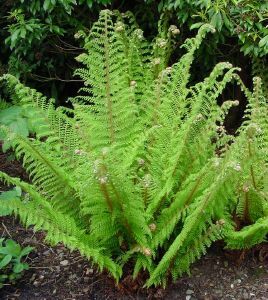 Hardy garden ferns are some of the hardiest, easiest and long lived plants that can be cultivated in gardens. They have modest requirements, shade being the main one, for though ferns will survive in the sun, they will never look their best. For some, soil moisture is imperative, whilst others are happier on dryer soils. It is true of course that ferns have no beauty of flower, but they more than make up for all that with the rich diversity of their foliage, in many shades of green. They can grow in areas which would challenge just about any flowering plant and they add texture and structure to planting schemes. Polystichum setiferum, the beautiful ‘Soft Shield Fern’ with its very fine lace foliage it was a favourite in Victorian times. The distinctive shaggy, moss texture and neat habit of growth sets this variety of soft shield fern apart. Young plants have a shuttlecock shape but, as clumps build up, the shapes overlap so the impression is more of a mossy mound. This is a superb textural plant that contrasts well with glossy, hardy ferns such as Asplenium scolopendrium, and other striking shapes such as Solomon's seal and Hostas. Plants are surprisingly drought-tolerant, although they dislike direct sun. Ferns are very easy to grow given a shady spot and the some soil moisture. These varieties are happy on most soil types. Whilst Ferns can grow in some sun, the best position is where they only get the morning sun. No real maintenance is required, but the deciduous ferns can have the faded fronds cleared in February to make way for the new growth, and even the evergreen ferns lay down the previous year’s fronds which can be cut back again to allow the new growth to shine through. Aside from being incredibly useful for shade areas in the garden, ferns add class to many planting schemes in part shade. Some such as the Polystichums do make very good container specimens on a shady patio.